The Lipolar Line of products contain several products under the Lipolar Brand. One feature they have in common is the content of fine and healthy fatty acids. In addition, they contain advanced antoxidant sytems and vitamins. The content of vitamins differ slightly in different markets. Some of the products in the Lipolar Line still under development and evaluation. 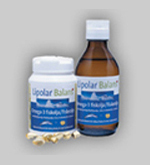 Please click on the links above for further information about the Lipolar brand products.